This entry was posted on Sunday, August 28th, 2011 at 15:14 and is filed under Barack Obama, Business, Economics, Politics. So if the Kenyesians are right…London should be experiencing a massive economic boom any day now…. My first thought was, since we're already heading into a double dip (I don't think we came out of the first dip), why not blame it on Irene, better than Obama getting the rap. They've blamed Bush and the Tea Party for Obama's failures up to now, guess it's time Mother Nature got her turn in the barrel. 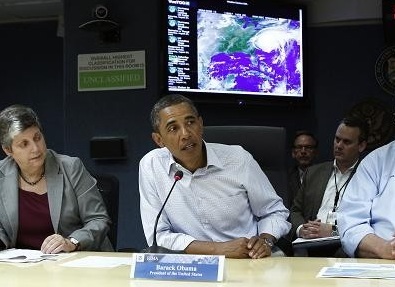 Obama at the hurricane command center looked like Michael Dukakis on a tank.